Your opening paragraph for this review is just beautiful, Keertana. I have been preparing myself to read this book for over a year, but unfortunately I'm not quite there yet. But wow, what an amazing review! I love the way you describe the characters and the love story. And you're right, we do owe that debt. I think I'd better pull this off the shelf soon. Yes! I really liked Lina and her strenght too. Only someone like her could have endured all that and remain sane. I also adored the subtle romance. That one sentence was enough, wasn't it? This book was a huge eye-opener for me in more ways than one. I loved every second of it. Fantastic, beautifully written review, my friend. Your review for this book is so beautiful Keertana! The plot of the book reminds me of another Holocaust non-fiction work which I read called "The Cage" by Ruth Minsky Sender. I highly recommend that one too. Oh, this book. I've tried so hard to gather the courage to read it countless times, but I still haven't managed yet. It's the subject matter, I think. I did quite a bit on Stalin a few years ago when I was in school, which is probably the only reason I know so much about his rule. I doubt I would, otherwise. Anyway, your review has me wanting to grab my copy and cracking this open. I feel like I really should meet this Lina soon. Beautiful review as always, Keertana! I'm glad you were, for the most part, impressed with this. I am so happy that you loved this book! I read it in December last year and loved it also :) I am sorry that you were left disappointed in the ending. I actually loved it! Beautiful review! Splendid review! Love the way you convey all of the wonderful things about the book but include your thoughts about its imperfect ending too. Every time I read a review of this book I want to go back and re-read it (after reading it about a year ago.) Great comparison with The Boy in the Striped Pajamas too - not only are their subject matters similar but the way they convey the story through their writing works amazingly as well. What a beautifully written review, Keertana! I've had this book on my radar for a while and actually just got it out of the library a few days ago, so I plan on reading it very soon. I do plan on making sure I have a good understanding of the type of book I'm getting into here and that I'm in the right mood. I do think the book is definitely more intriguing simply because it focuses on a lesser-known aspect of a well-known conflict. I have not read The Boy in the Striped Pajamas, so hopefully I won't have certain ending expectations like you did. I am glad you were able to enjoy and appreciate this book overall, though. I think this is such an important book, and it makes me happy to see so many people reading it and appreciating it. It's such a moving and powerful story, I remember still reeling for days after finishing it. I think the author did a wonderful job in communicating how horrific the situation was, yet not painting the characters as purely black and white. I think it was a very honest and brave portrayal of events. Lovely review! Beautifully written review as always Keertana! This books sounds poignant and heartbreaking and gorgeous, and I really need to make time to pick it up! I actually think I prefer a book like this not to end on a gut-wrenching note, my poor little heart couldn't take it, so that will likely work for me:) Glad you enjoyed it so much my friend! I am a wuss too when it comes to reading these types of books. I know it will gut me and leave me haunted as they always do, and I do intend to read this when I am in the right frame of mind. I know it is one of those books that will change me, as it did you. Lovely and thoughtful review. Keertana, I love the comparison you drew with this book and The Boy in the Striped Pajamas, because they're both really quite alike. Although, maybe because I read this in 3rd grade (my elementary school librarian did it as a read-aloud, which I think was quite a bad decision), I find myself preferring Between Shades of Gray. And one of the biggest reasons is because of the ending, contrary to what you said. I think when a book ends SO depressingly, as with The Boy in the Striped Pajamas, that just takes away from my reading experience, because there always has to be hope. 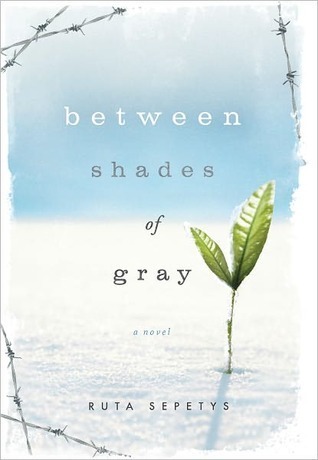 With Between Shades of Gray, the ending was a mix of sadness and hope, which is exactly what I loved about it. Anyways, I have to agree with everything else you said. Even with her faults, Lena was a fabulous main character and the touch of romance was fantastic. First of all, I have to say how beautifully written your review is. This book sounds like a book that I would adore. Though I will make sure to mentally prepare myself before starting it. Its also interesting to read about something that happened way back, and a story based on a true story. Will def have to read this. I am with all these other people who say they are still working up to reading this book. I love that it features a great cast of characters, and is about a part of history that is often looked over. I adore books that bring to my attention information that I may never have known otherwise, and to place it within an engaging story is a huge plus. I have OUT OF THE EASY on my shelf and will start with that one, and hopefully one day move on to this book. Lovely review.